Story of My Life is a Windows 8 Journal App. It can be used to maintain your Journal or Diary. Story of My Life also allows you to add photos, video clips, and pictures to your Journal entries. Use all these features of this Windows 8 Journal App to store your memories. Get Story of My Life absolutely free from the Lifestyle category of the Windows Store. Using this Journal app is quite easy. On the main screen of this Windows 8 Journal App, using the bottom flyout, you can start adding new entries in it. To get the bottom flyout, right click anywhere on the interface of this app. 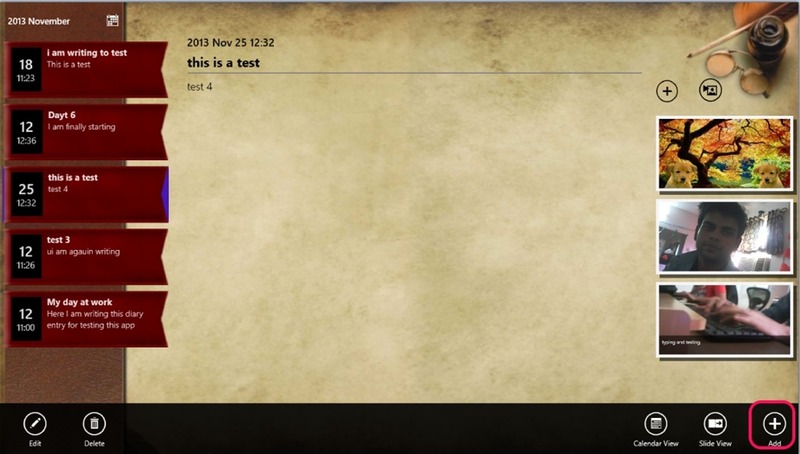 You will have the option to add new entry to this Windows 8 Journal App. Now, for each new entry in this Windows 8 Journal app, make a headline, give a date to it, and write your story. After that, right click to get the save option in the bottom flyout of this Windows 8 Journal app and save it. You even have the capability to add photos, videos, and pictures to your entries. For that, use the option that is available in the panel on the right side of the entry you have made. Click on it and the option to add videos, photos, and pictures will appear. 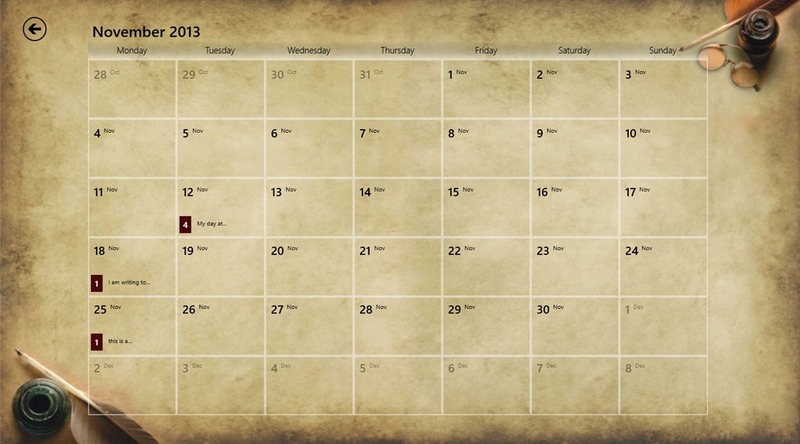 Now, you can use the calender view that is given in the bottom flyout to reach the journal entry that you have made using this Windows 8 Journal app. Use these features to add entries and maintain your Journal. Also check out Journal, Ultimate Diary, and Digital Diary. 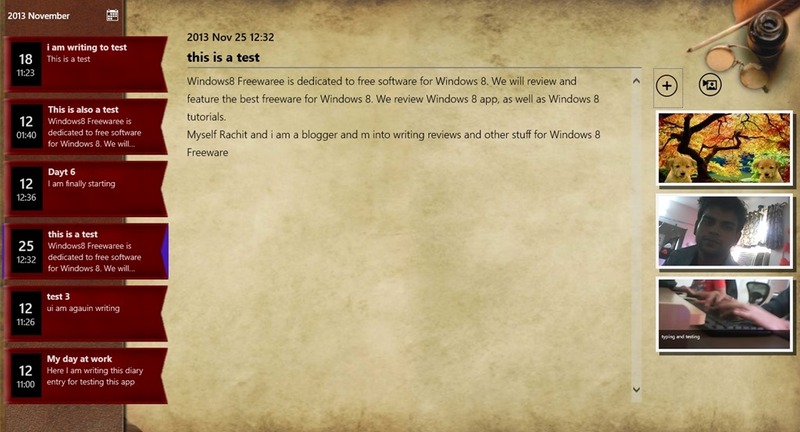 Completely Free: This Windows 8 Journal app is available free of cost in Windows Store. Nice Interface: The User Interface of Story of My Life is quite attractive. Ease of working: The app is easy to work upon. You will easily understand its working. Add pictures from your local storage. In addition to that you even can add photos and can make videos with the inbuilt functionality of the app and can add them to your Journal entries. Organize your memories and keep them for a long time by using this app. Finally, to conclude all, I would like to say that this Windows 8 Journal app is quite nice. Its interface is quite attractive and working with it is quite easy. In your journal entries, you even can add pictures, photos, and videos as a piece of remembrance for any particular Journal entry. All in all, a nice app, Story of My Life deserves a try for sure. Don’t forget to share your experience of the app. Get Story of My Life here.